A journey through Hesse is like time travel through the architecture of the ages, from medieval castles to post-modern industrial design, each with monuments of global significance. Many of Hesse's medieval towns and villages charm the visitor with an air of idyllic romance. The key religious centres, such as Fulda and Limburg, are adorned with impressive churches and cathedrals. You can enjoy a meal at many of the monasteries, where you will see evidence of their historically powerful influence on the political, cultural and social development of the regions in Hesse. Numerous castles unveil the fascinating world and lifestyle of royalty and nobility. Lovers of contemporary design will be equally rewarded in Hesse, with buildings - not only in the City of Frankfurt - that will find their place in architectural history. Shopping galleries, museums and factories are challenges that have been mastered by internationally renowned architects. Important chapters of valuable history of the European Continent were written in this State. Nobility built castles along the rivers and people lived behind ramparts and walls of medieval cities. The Church owned influential abbeys. This area promises charming towns with timber-framed buildings, Germany's highest fortified tower and the wilderness area of the Orke Valley south of Lake Edersee. Hesse is the state in which the fabled forests of the Grimm brothers' fairy tales exist. Between Hanau and Sababurg Castle is 185 mile trail through Rheinhardswald Forest where Sleeping Beauty, according to legend awaited the prince to wake her from slumber. Along a 31 mile stretch, more than twenty castles and residences of local aristocracy can be seen as one winds through vineyards and across ridges with fantastic views. Situated in the heart of Germany, here one finds apple wine, active vacations and opportunity to experience nature in a land of fairy tales. The German Fairytale Route starts at the birthplace of the Grimm brothers (collectors of fairytales, founders of German linguistics study). Also a gold making centre. The Cathedral is one of the most outstanding Baroque buildings in Fulda. The architect Johann Dientzenhofer built the cathedral in the new Baroque manner (1704-1712) re-using the architectural core of the ancient Abbot Ratgar's Basilica (9th century). In its architectural design the cathedral is inspired by the Roman Baroque style. After the completion of an extensive restoration the building, inside and outside, has returned to its original splendour. It owes its religious significance to the tomb of St. Boniface, still the goal of pilgrimages. 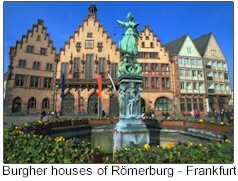 Limburg an der Lahn lies in the fertile valley Limburg basin between the hills of the Taunus and the Wesrterwald. 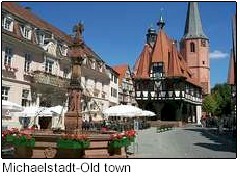 It is a town of picturesque half-timbered houses dominated by the Cathedral with its seven towers, one of the finest creations of early German Gothic. Limburg grow up around its church and its castle, and its first recorded as a town in 1277. The old half-timbered town centre and the cathedral high above the Lahn give this city its flair. Erbach i. O. is resplendent as the historic seat of the Counts of Erbach-Erbach and is world-renowned as a centre of ivory carving. The half-timbered town hall in Michelstadt is over 500 years old and one of the most photographed buildings in Hesse. Wine region on the Rhine. Wine and high spirits - especially in the narrow winding Drosselgasse. A commercial metropolis (banks, trade fair centre, famous skyline) with a great history as a free city and setting for the coronation of kings and emperors. Today the Rhein-Main Airport is a gateway to the world. The city's most famous son: Johann Wolfgang van Goethe. 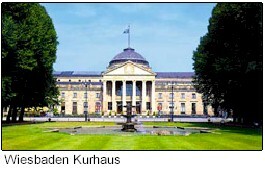 The first National Parliament convened in the Paulskirche in 1848. Highlights:Historic Römer town halI / Kaiserdom / Goethehaus / Palmengarten / zoo / Alte Oper / museums (including the Städel'sche Art Institute, Museum for Modern Art and the Senckenberg Natural History Museum) / the traditional "Ebbelwoi" cider pubs in Alt-Sachsenhausen.